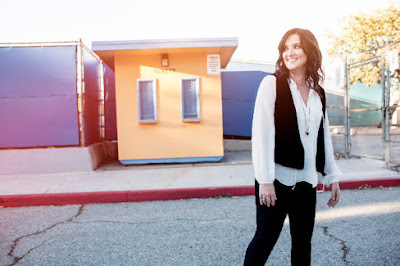 When acclaimed singer/songwriter, CMA Award winner and four-time GRAMMY nominee Brandy Clark went into the studio with Jay Joyce last year to record what would become her June 10-released Big Day In A Small Town, she can now admit she did so with a self-imposed pressure. “There was definitely pressure – even just in the idea of recording a follow-up to 12 Stories—but that was honestly a good thing as we channeled it into more of a driving force; for me, it helped me focus, and really take what we had nurtured on the road, and funnel those miles and experiences into these recordings,” reveals Clark now after having her new music out from underneath cloak and dagger for nearly one month’s time. Before Big Day even hit shelves, Garden & Gun's Matt Hendrickson had already dubbed her “the best songwriter in Nashville,” but Clark had personal ambitions to obtain acclaim as a singer and an artist in her own right for her sophomore album. With Big Day landing on numerous critic lists including Rolling Stone’s 25 Best Country & Americana Albums of 2016 So Far who lauded, “it's music tooled alternately for stadiums and songwriting circles, commercial and public radio, line-dance bars and coffee shops…Clark is good at bending country boilerplate,” she now feels one step closer toward that acceptance. It’s a balance Clark has worked hard to achieve, and with a rich vault of material on her new album, critics are noticing more than just her writing this time around. “Brandy Clark digs deeper in the dirt with this rave-up, which takes its titular metaphor and a persistent guitar line and twists them into a sharp parry against societal expectations,” writes Maura Johnston of TIME Magazine, where Clark’s feisty single “Girl Next Door” landed on the Best Songs of 2016 So Far list. “…as usual, Clark's words are worth a thousand pictures,” claims Otis Hart of NPR, where she landed acknowledgement on their Songs We Love list for the poignant track she penned about her father’s death, “Since You’ve Gone To Heaven,” which has quickly become a favorite of fans and critics alike. “If 12 Stories established Clark as a storyteller, Big Day in a Small Town makes for poetic (and at times brutally honest) evidence of the empathy that comes with that territory,” acclaims Dacey Orr of Noisey/VICE. July 7 Halloran Centre Memphis, Tenn.
July 8 George’s Majestic Lounge Fayetteville, Ark. July 14 Pennysaver Amphitheater at Bald Hill Selden, N.Y.
July 22 Bank of New Hampshire Pavilion Gilford, N.H.
July 23 Forest Hills Stadium Forest Hills, N.Y.
July 30 City Winery Chicago, Ill.
Aug. 4 Bethel Woods Center for the Arts Bethel, N.Y.
Aug. 12 The Camp House Chattanooga, Tenn.
Aug. 18 Goldfield Trading Post Sacramento, Calif.
Aug. 19 Antelope Valley Fairgrounds Lancaster, Calif.